There are many unique quests scattered across the world. The following screenshots are designed to help you navigate basic quest acceptance, from a quest board, and view that quest in your log. There are other quests throughout the world which will have a guided interaction with an NPC that may not require the use of a quest board, but you would still manage and view them from your quest log. To view your quest log, click on your avatar once (or shift+click if you've enabled that in your client) and select Quest Log from the context menu. NOTE: You may also open and view your quest log by typing in [questlog. You can bind this to a say macro in your client, or thru Razor/UOSteam to create a hotkey. To view a specific quest in your quest log once it has been opened select the line item for the quest in question and select Open. To quit the quest select Drop and then answer the prompt that appears asking if you are sure you would like to delete/drop the quest. Viewing a quest: When you select Open you'll be shown the following prompt. It will likely contain more information about the quest such as instructions, a description, or what you were hired to do. In this case, we can see that an NPC named Kedar has hired me to kill 20 Bone Knights. NOTE: For some quests using the Collect button is not required. In the case of a quest where you are hired to hunt something, such as in our example, your progress is automatically tracked for you. In the case of a crafting quest where you are hired to collect specific items, you would need to use the Collect button to gather the materials and take credit for the quest. Select Yes and hit Ok and the quest will disappear from your quest log. NOTE:If you change your mind and select No what appears to be a blue hued spell book will appear in your backpack. This is called an XMLQuestHolder. Once it has appeared in your bag the only way to permanently get rid of it is to drop it, go back and drop the quest, or complete the quest. 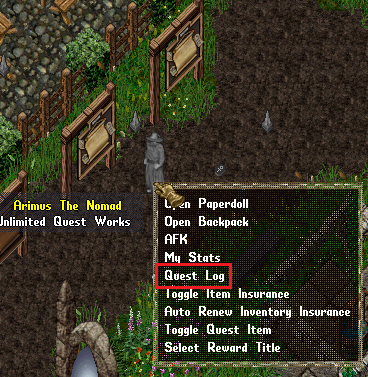 This is not a bug but how the Ultima Online client stores and manages the XMLQuest system.